Nominations for the 2017 Governor’s North Star Awards for International Excellence should explain the accomplishments and success of the international activities that have occurred in the past five-year period from 2012 to 2016. A completed nomination consists of no more than five pages of material. Nominees are eligible for consideration once in any consecutive three year period. Please use the “Nomination Form for Governor’s North Star Awards for International Excellence,” as the first page of the five pages. Brochures, photos, and other materials count as part of the five pages. Nominations are due no later than December 8, 2017. 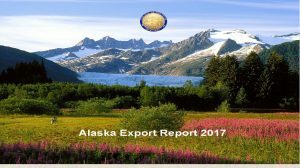 Download the 2017 State of Alaska Export Report (pdf).